It may seem strange, but the Beatles only played once in Oxfordshire. 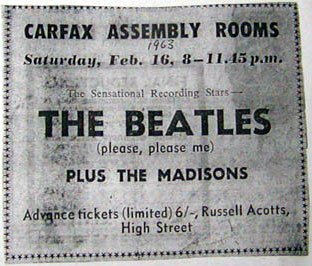 On 16 February 1963 they appeared at the Carfax Assembly Rooms in Oxford. As you can see from the invitations, there was also a group called The Madisons on the bill. After the show The Beatles met up with Jeffrey Archer, who would later become a famous novelist and politician who was a student at Brasenose college. Ringo made the famous comment that "Jeffrey seems a nice bloke but he is the kind of guy who would bottle your piss and sell it!"